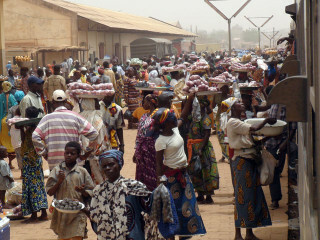 Ouagadougou — Abidjan. What a ride, 1,180km of searing heat in 46 hours… and a seat for The Ball. 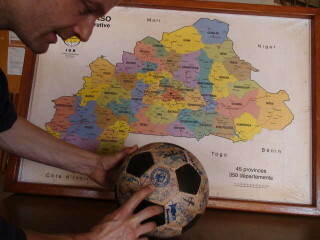 This single track giant of a line, dating back to 1905, is carrying The Ball, Phil and me from the heart of Burkina Faso to the tropical Côte d’Ivoire. We were told “don’t go to Côte d’Ivoire, it is far too dangerous”, “watch your back there, there are thieves everywhere.” “Don’t trust anyone”. “Watch the political situation. It is a volatile one. ” “It is getting ready to erupt there” said a French pilot we met in Mali, “the people want elections, they have been waiting for many years. The government cannot hold out much longer. 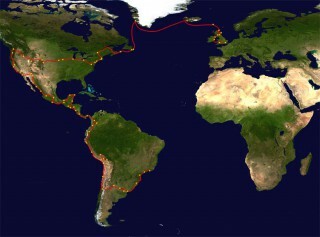 It will go off there in the next month.” I am particularly worried about this leg of the journey. There was a civil war here recently and our train is taking us through the heart of former rebel territory and its capital Bouake. I am also paranoid that our video camera might get confiscated. The train line is one of national security and monitored by the gendarmerie. But trying to prevent Phil from recording is a tough job for anyone at the best of times. He is also hoping to climb onto the roof of the train to film from above. 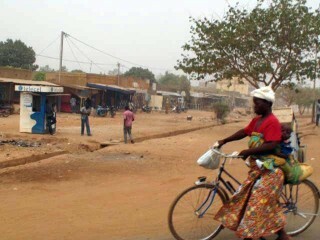 A typically active stop off in Bobo Dioulasso, the last big town in Burkina Faso before we head into Côte d’Ivoire. Phil is much more relaxed about the whole situation. I worry when we can’t get a hold of Charles who is due to pick us up at the end of this gruelling ride… our mobile is not working. Phil chills. I’ve heard that bandits operate on the train which should arrive in 2 days time, if there aren’t any unforeseen technical problems. Phil continues to chill. I’m quietly looking forward to seeing the back of Cote d’Ivoire and I haven’t even set foot in it yet. 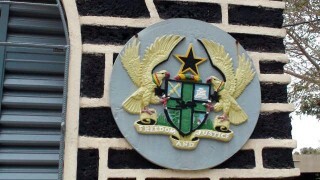 The prospect of Ghana and visiting my friend Kweku is very appealing. 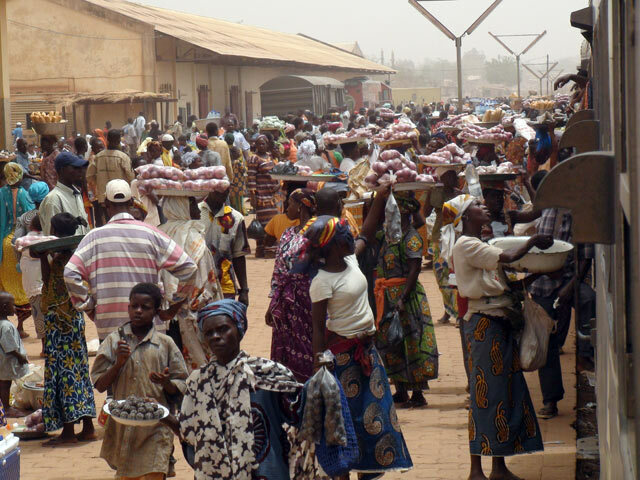 As the train rolls onwards, we start getting to know some of our Ivorian and Burkinabe neighbours. We drink beer with them, share food with them and joke with them. We have plenty of time to contemplate this roller coaster of a trip to the World Cup, endure some rigours of sub-Saharan long distance travel and open up The Ball’s Côte d’Ivoire adventure with a lightning-quick game on a station-side pitch. 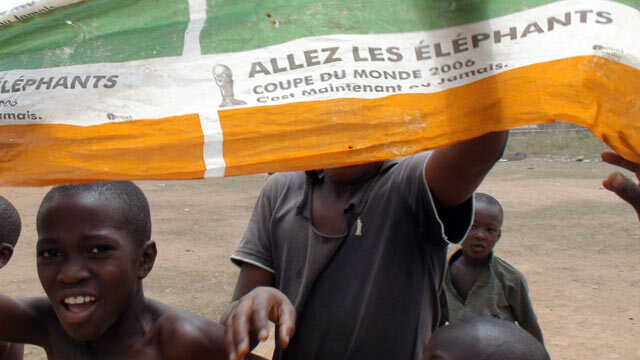 …and our first sight of the Ivory Coast national team: Allez les elephants! Soon to play in the World’s greatest competition. 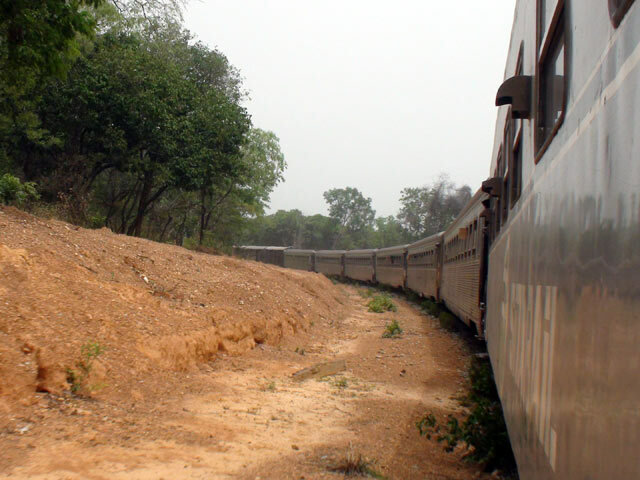 As we cross into Côte d’Ivoire, almost a whole day into our journey, I have no more fears. I am excited to visit Abidjan and slightly embarrassed about my paranoia and very tired from this long, exhausting train ride. Onward. 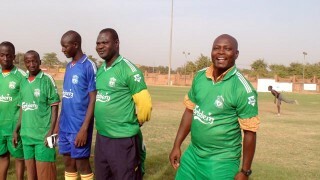 We are scheduled to play in a Unified Football tournament today. 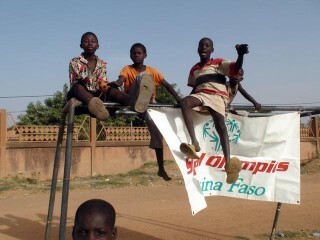 As ever in West Africa, the fearsome heat makes us anxious about taking part. But these events are such fun that it is impossible to stay on the sidelines. So bring on the football, bring on the sweat! 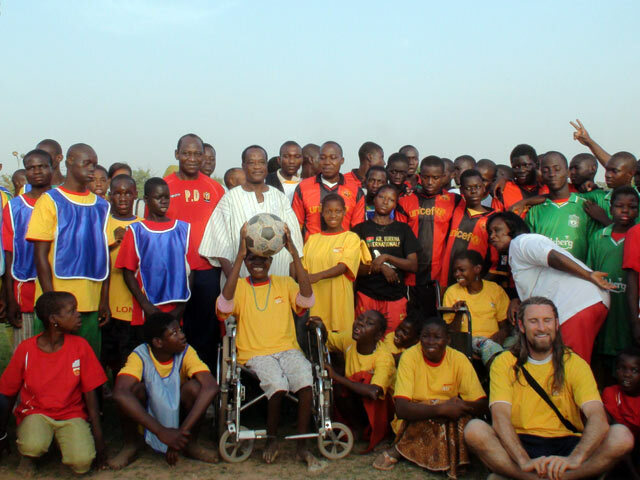 Special Olympics athletes are joined by DHL staff and members of the Burkina Faso Football Association including its president and members of the national Burkina Faso Under-17 team, who have competed at the recent Under-17 World Cup in Nigeria. Being a Liverpool fan, Andrew is very keen to play on the team that is dressed in the Liverpool kit. An open and friendly atmosphere develops as everyone gets to know one another. All the teams play against each other and once more football is the winner. Some of the Special Olympics athletes who are playing have quite severe disabilities, but they are accepted as players of equal importance to each team. 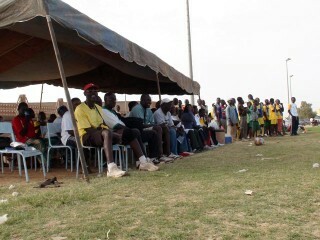 The large crowd of spectators (we estimate around 500 people have turned up) seem to enjoy the games a lot and are very vocal in their support. The post-football celebrations show that making new friendships means that, whatever happens on the pitch, everyone is a winner off the pitch. 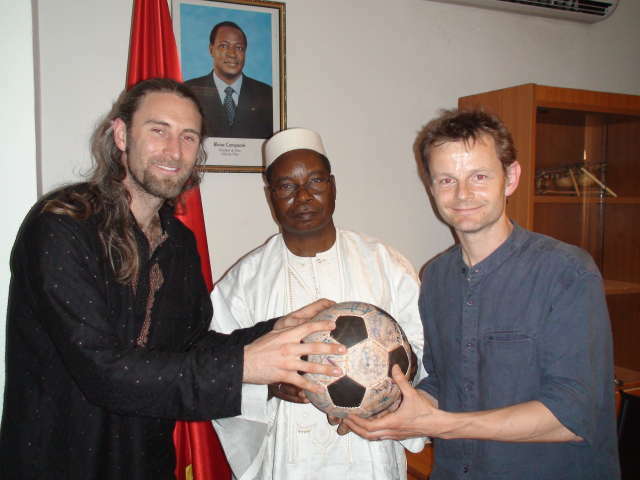 André and Chantal tell Andrew that they support a local community called Kalzi, a small village 30 kilometers off the beaten track from Ouaga. They financed the building of a classroom and are set to invest more in infrastructure. Andrew travels with André and Chantal to Kalzi to have a look at what they are doing. Unfortunately the school is closed. It is a Saturday and school holidays are starting today. Upon arrival, the Ball comes out straight away. 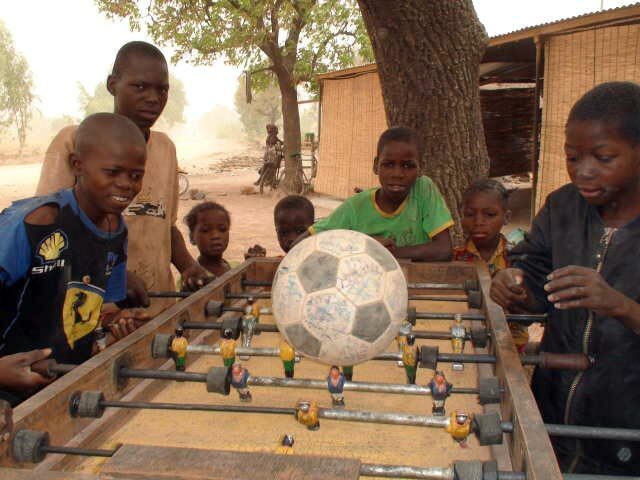 It’s introduction to Kalzi is being played with in a game of table football. A kickabout is quickly organised outside the village’s central community meeting place. It is dusty, very dusty. Warm, sandy Saharan winds have been blowing in from the north all morning. The sun is barely visible and, as usual, it’s blisteringly hot. With all this dust in the air, it’s not the best weather for football. But the children are flocking to The Ball. We are ushered to the football field. Well, it is a very hard flat open area covered in dust. Large stones are set up as goals and teams are being formed. Lights versus darks. Henry, Messi and Drogba are all playing. Game on. The game lasts for about 40 minutes. The kids, playing barefoot are full of running. Andrew and Alex, a guy from Italy who happens to be in town, are the captains. They tire quickly and cough repeatedly. The score is tied at 2-2. 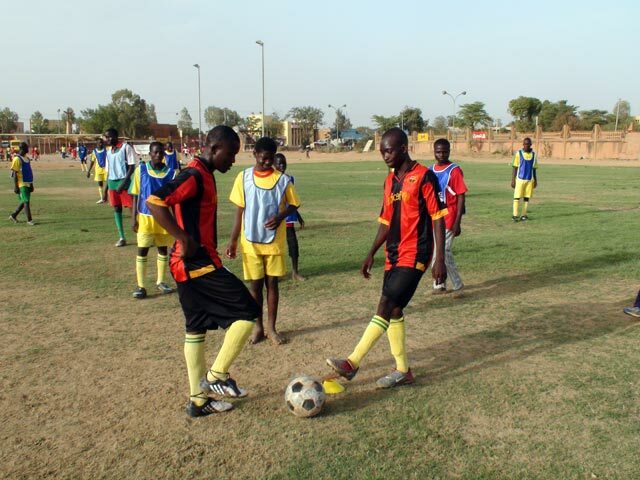 Golden goal is played but neither team can score that all-important, decisive goal. Despite throwing everyone forward and half a dozen goalmouth scrambles the teams are inseparable. It’s going to be penalties to decide this one. Lights win the shootout, but there is delight all round at the end of the game. 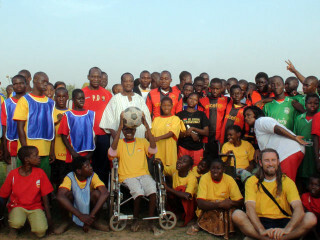 Yet again, it is a privilege to be involved, a privilege to meet the players and to have such fun. 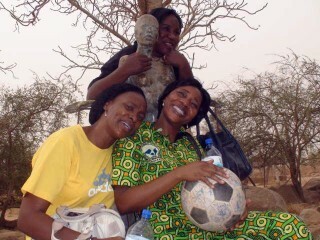 We have a little free time today, so Special Olympics arrange a visit for us to a renowned local attraction — the Laongo Sculpture Park, a little way out of Ouagadougou. 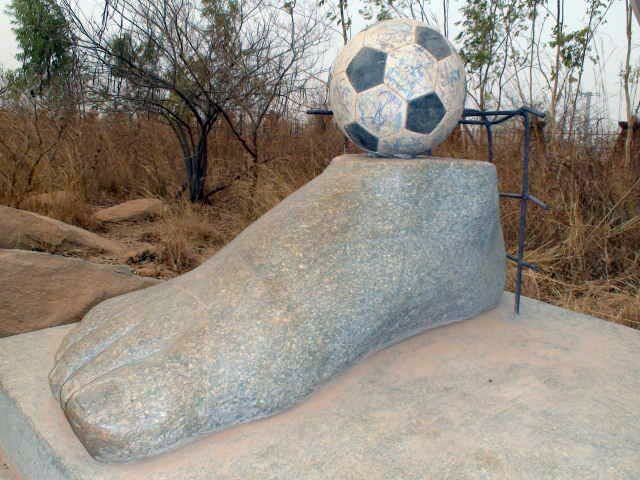 There are many wonderful sculptures to be found dotted about in the bush, but this one seemed particularly appropriate for The Ball. Foot Ball. Today we are off to meet an ex-goalkeeper, but not just any ex-goalkeeper. 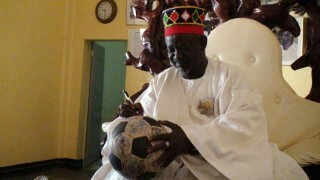 This one is “the King of all Kings”, Mogho Naaba. “Mogho Naaba is more popular than the president in Burkina Faso,” says Patrick, our driver from DHL, as we head for a traditional ceremony that is open to the public. Mogho Naaba is king of the Mossi tribe, an ethnic group that covers much of Burkina Faso and reaches into the Ivory Coast, Ghana and Togo. 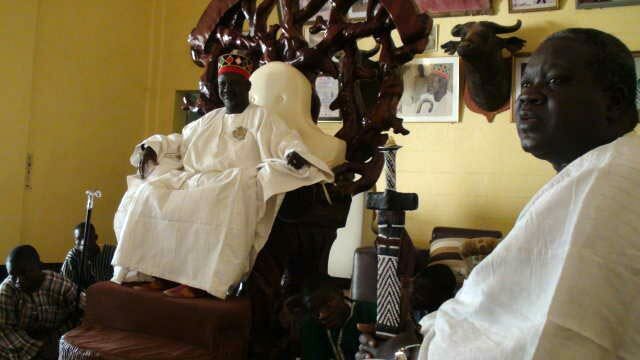 Mossi tradition dictates that the eldest son of the enthroned king must be banished from the royal court. 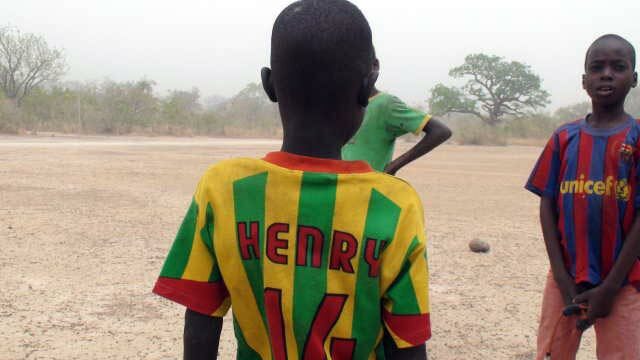 And so, at the tender age of 7, the current Mogho Naaba was sent into exile in France, never to see his father again. When his father eventually died, he was called back to Burkina Faso and became king himself. The ceremony that we witness takes place every Friday and dates back hundreds of years to the appearance of the first colonial invaders. Unfortunately for us, no photography of the event is allowed. At the start of the ceremony, the king prepares to leave for war dressed all in red, the colour of blood. His horse awaits him in front of the royal palace. But his ministers attempt to prevent him leaving, begging him not to go to war. The king listens to their appeals, goes back into the palace and minutes later returns dressed in white. Relief all round — there will be no war today. And so from now on, thanks to the insight of a king, we have a new rule to accompany the signing of The Ball — a goalkeeper is allowed to sign it, but only if he or she catches it first. 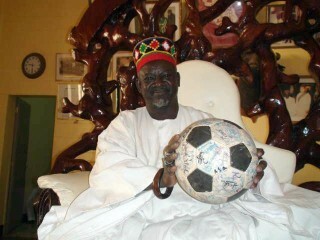 Afterwards the king leads us on a tour of his private football museum, which is a treasure trove of memorabilia. It includes a signed Ivory Coast shirt worn by his friend Didier Drogba at the 2006 World Cup in Germany, a framed photograph of himself and Roger Milla taken at a celebrity football match, where he played in goal. And his prized possession? A shirt signed by the entire Welsh national team. He leads us to it with a broad smile. This shirt, he tells us, was worn by Ryan Giggs, with the famous number 11 on it, and it appears to be the king’s favourite. 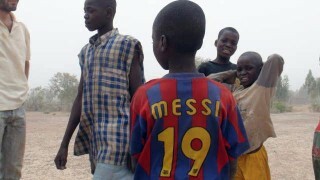 Perhaps he is a Manchester United fan? Diplomatically, Mogho Naaba wouldn’t say. 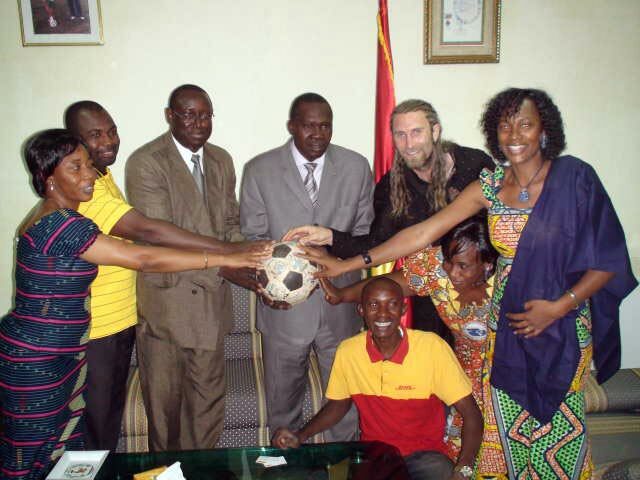 The Ball arrives in Ouagadougou to find that a meeting has been scheduled with the Minister of Sport, M. Jean-Pierre Palm. 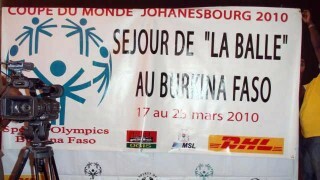 The meeting has been arranged by Special Olympics Burkina Faso (SOBF) to welcome The Ball to the country and introduce it to the national authorities. We are slowly beginning to understand and appreciate the rituals and formalities of these official events. They are a great opportunity for everyone involved to get to know one another — both personally and professionally — and for a real dialogue and a constructive exchange of views to take place. 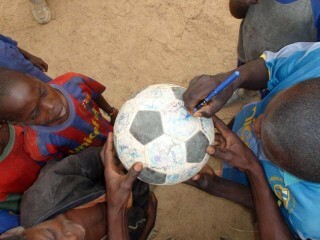 When The Ball is passed, whether in the street, on the field or in the boardroom, a connection is made. The Ball feels honoured to meet the Minister and hopes that the dialogue that has been opened will lead to greater opportunities for Special Olympics athletes in Burkina Faso. 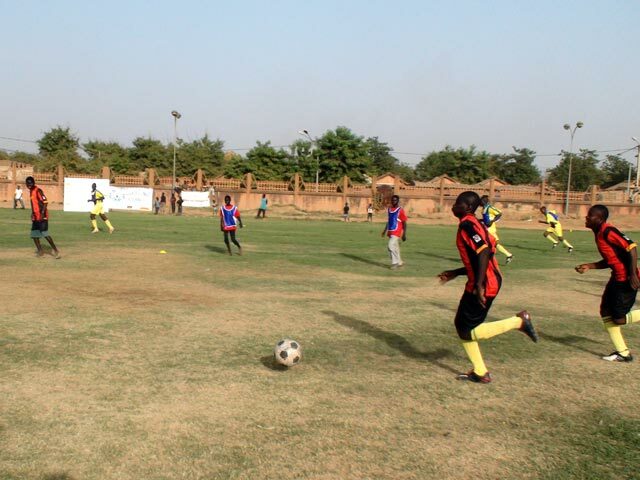 Next up is a press conference in association with the Burkina Faso Football Federation (BFFF) at the National Stadium, the Stade du 4-Août. It was very well attended, with a big turnout of representatives from the media. 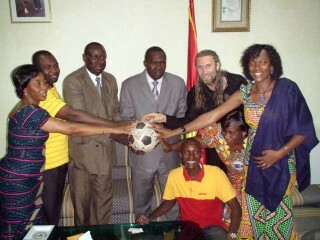 Although Burkina Faso have not qualified for the World Cup itself, the press is receptive to the connection with the tournament that The Ball represents. The connection is an unofficial one, but The Ball’s journey is very real. It reminds people that football can be a powerful catalyst in spreading the message of inclusion — and that the programmes that Special Olympics run are the very embodiment of the spirit of the beautiful game. As a German resident, I needed to apply for my Nigerian visa in Berlin. In Germany in January, I didn’t have enough time and was subsequently informed that there was no way I’d get a visa anywhere en route as Nigerian visas are only issued in your country of residency. 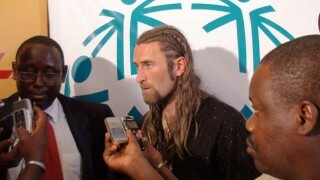 It looked very much like I wasn’t going to be able to get into Nigeria. The way the trip has turned out, I will be solely responsible for carrying The Ball from Ivory Coast to Cameroon, including Nigeria. 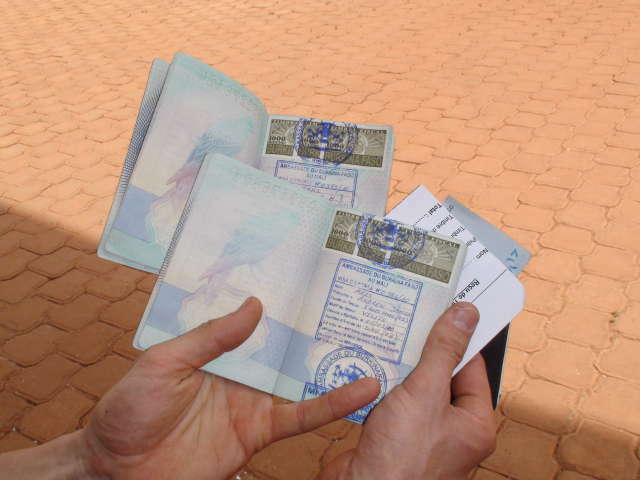 What happens if I can’t get a visa? 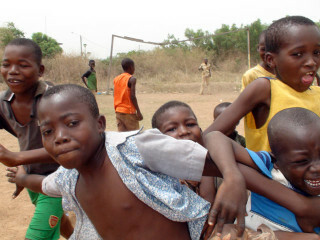 Would I be stuck in Benin? Would The Ball have to go on without me​? 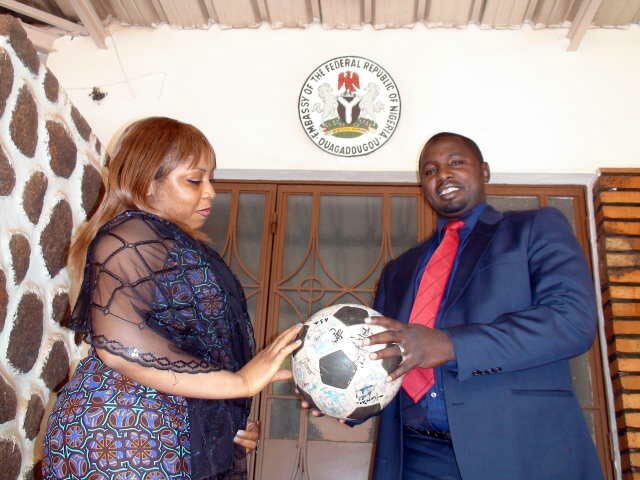 Most likely The Ball would not vist Nigeria. 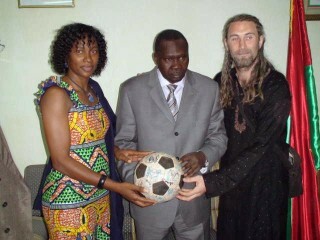 That would be a real pity as SO Nigeria have been planning events for The Ball in and around Lagos. From a personal point of view, I’ve been very worried about the political situation in Nigeria where there have been kidnappings of foreigners, killings across different ethic groups and where the general situation appears to be dangerous and deteriorating. I’ve been starting to think that it might not be a bad thing if I don’t get my Nigerian visa. 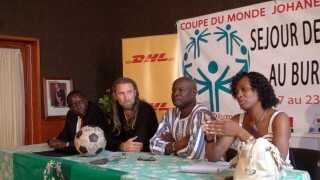 Special Olympics Nigeria are on the case, however: Folashade Bolumole, SO Nigeria Director, has been in touch with the Nigerian goverment in the capital Abuja. 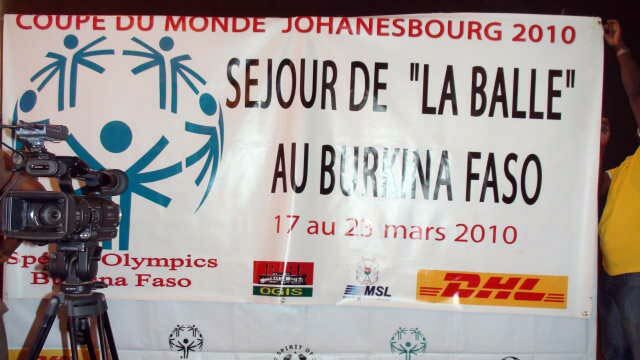 Special Olympics have taken control of the situation, and as we arrive in Burkina Faso there is news — The Nigerian Embassy in Ouagadougou wants me to come by for an interview. 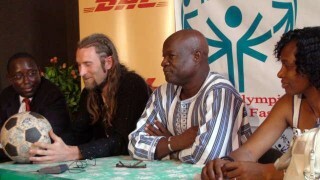 I turn up there with a representatives from the Burkina Faso Ministry of Sport and DHL and a letter of support from SO Nigeria. The Nigerian embassy staff are very keen to accommodate us and, to my surprise and delight, the visa will be ready within an hour. I have a question about the political situation in Nigeria. “Is it too dangerous to travel there?” I ask. “The trouble is just in one region. 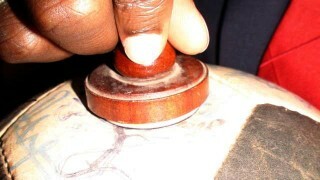 That is the Niger Delta. The rest of the country is safe. Nigeria is a wonderful country. You’ll have a great time in Lagos,” comes the reply. In my mind, I start reflecting on perceptions of Africa… we who live outside Africa hear so much about the problems of the continent. We sit in our living rooms and see pictures on the TV of war, famine, disease, ethnic cleansing and we hear about corruption and mismanagement. Yes, of course, some of these things are happening and are only too real — but the Africa I am getting to know is vastly different. 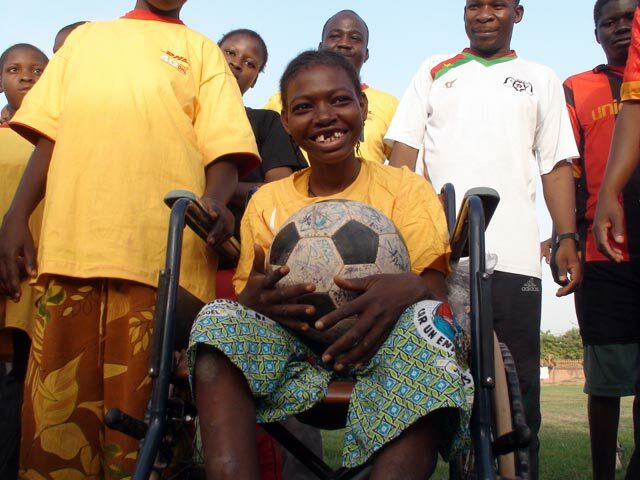 We are constantly meeting friendly people with smiles on their faces and a generosity that often goes beyond their means. A lot of these people may not have the level of material wealth that so many people in Europe have, but, to my eyes, they are often much happier. What is it that we have lost but that they have not? Suddenly, I’m excited to be heading to Nigeria: With the positive energy of The Ball at my feet and the support of partners on the ground the prospect of Lagos’ chaos is enticing. Let The Ball roll. We are off on yet another visa escapade. At the Burkina Faso embassy, we are met by stares from the receptionsists so icy they could power the air-conditioning. “Fill out these forms”, they say. Unexpected disinterest in The Ball and our story. Oh well, you can’t win everytime. Resigned to our task, we get stuck into filling out three identical forms. To our dismay, there’s not a photocopier in sight. We take some time out from the paperwork to look at a map of Burkina Faso — to plot our route from Mali to Ouagadougou and then on to Ivory Coast by train. As we turn in our paperwork the Chef de Protocol comes out and stamps The Ball. He’s not interested in signing it. But our biggest mistake? We haven’t brought any money with us to pay for the visas. So we’ve got exactly 30 minutes to get some cash and get back to the embassy. In the car and quick. 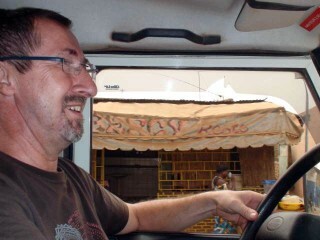 Kassim from DHL puts his foot down in his white Mercedes, Mali seems to be the place where all of Europe’s old cars end up. Every second car is a Mercedes. Anyway, first bank: no luck, cards not working in that machine. Second stop at the North South Hotel and success! Olé olé olé! Cash in the hand, it’s back to the Burkina Faso embassy. We arrive at midday, right on closing time. As we approach the embassy, the Chef de Protocol races out to meet us – excitement on his face. “The Ambassador wants to meet you. Now.” A surprise change of tack here — a much friendlier atmosphere, so upstairs we go. Straight into His Excellency’s reception room. Ambassadour Extraordinaire du Burkina Faso au Mali Sanne Mohamed Topan welcomes us with great warmth. We sit down, tell our story and philosophise about the world through one football — The Ball. 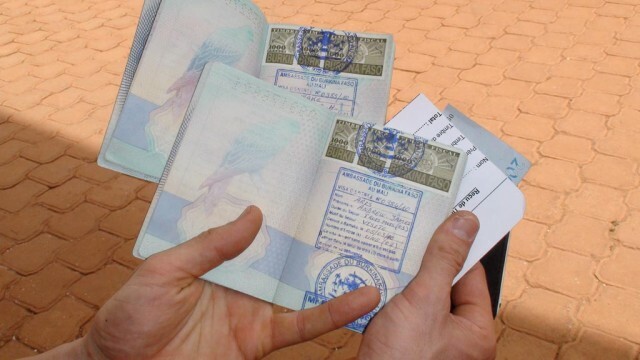 The most welcoming ambassador from one of the world’s poorest countries opens his arms to the project and tells us that he has decided to give us our visas for free – we’ll just pay for the tax duty on the stamps. We’ve won again. And so we end up paying a tenth of what we could have done. What a wonderful gift to The Ball, which is doing this journey on the slimmest of budgets. Thank you, Your Excellency, we are excited to visit your country next week.